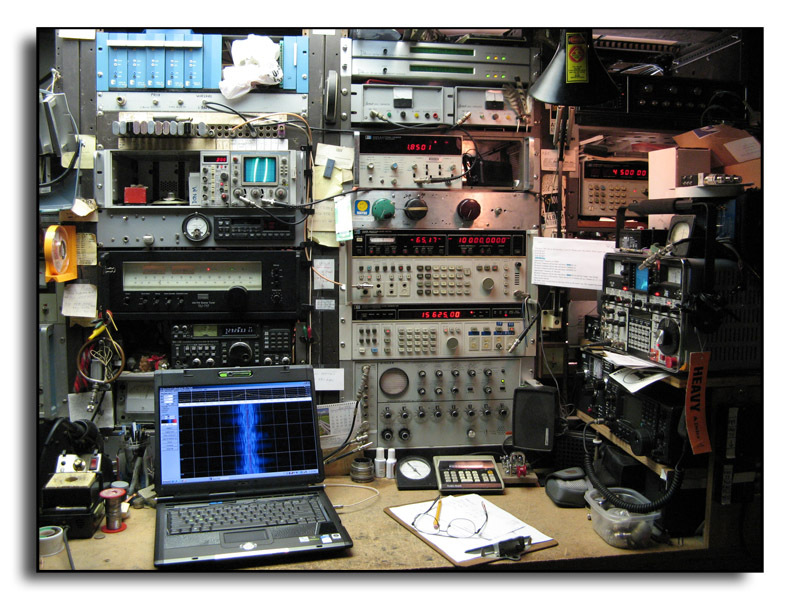 This is a picture of the off-air frequency measuring setup used at K6OQK. I also use this setup for the commercial broadcast off-air measurement service that I established about 35 years ago. The frequency standard is GPS referenced using two, DATUM 9390, Phase steered Frequency and Time Code Generators with separate antennas, one as a backup, which is continuously phase compared to the main GPS receiver. For the FMTs I use a GPS referenced HP-3586B as my receiver. One of the things you quickly discover about the HP-3586 series SLM receivers is that the 1850 Hz tone, while accurate enough for its original intended purpose, is far from the accuracy required for our current level of precision frequency measurements. This is because the 1850 Hz tone is derived from the Product Detector that uses one of two crystals, dependent on the sideband selected, to generate its carrier. These crystals are not precise. They tend to be off by several tenths of a Hertz and they drift. Because of the conversion scheme used in the HP-3586B, the I.F. error is in the opposite direction of the incoming signal's error. By using this I.F. method I have totally removed the steps and the need to calibrate around the Product Detector and its 1850 Hz tone errors. I start by presetting my receiver’s memories to the FMT’s published frequencies as well as the receiver parameters I want to start with. Since I’ve recently started using the time-averaged results from Spectrum Lab for measurements over long paths, I want to get as close to the correct frequency as soon as I can in order to give Spectrum Lab as much time as possible to time-average the signal without my tuning the receiver. As soon as I hear the FMT station’s CW Call-Up announcement I immediately begin to tune the HP-3586B receiver, starting with the 3.1 kHz bandwidth, first in 10 Hz steps and then as I get closer to the actual frequency I reduce the frequency steps to 1 Hz and reduce the I.F. bandwidth of the HP-3586B to 400 Hz and eventually to the 20 Hz bandwidth position, all the time homing in to produce as close to a 1:1 stationary Lissajous as possible. Using the oscilloscope and the Lissajou I can usually get within 1 Hz or very close to 1 Hz during the CW Call-Up announcement. The reason I personally prefer to use 1 Hz steps is that it is much easier for me to quickly work with whole numbers than fractional or decimal numbers. Once the receiver is tuned to the nearest whole cycle (Hz) I can move the HP-3336A’s frequency in mHz steps to make the Lissajous pattern stand still - something that can rarely be accomplished in a actual FMT over a long path due to Doppler shift. The receiver’s 15,625.00 Hz I.F. is also monitored using the waterfall display of Spectrum Lab set for +/- 5 Hz of the 15,625 Hz center frequency. This allows me to time average the incoming signal's frequency for the duration of the FMT's key down period. Here’s an example: If the HP-3586 receiver ends up tuned to 3,555,654.0 Hz to produce the closest to a 1:1 stationary display then I know I am within 1 Hz. I can then move the HP-3336A generator to try and make the Lissajous stand still. If the HP-3336A ends up being 15,624.33, then I know the error is 0.67 Hz (15,625.00 Hz -15,624.33 Hz = -0.67 Hz) (corrected to a +0.67 Hz because of the conversion direction) as received at that moment. If Spectrum Lab and the Lissajous agree over the three-minute key down period it's a miracle. Depending on the direction of the error I will either add or subtract that I.F. error to the "tuned-to" frequency of the HP-3586B. In this example the measured frequency is 3,555,654.67 Hz. I’ve experimented with injecting a precise low level signal on a nearby whole-Hertz frequency and measuring the difference using Spectrum Lab. The results have been very comparable to the method I described above. My antenna is an Inverted-V, 105' on a side running north to south with the apex about 40' up in a tree. It's fed with balanced line all the way into my Shoppe. For my ICOM radio I use a MFJ 974H balanced tuner and for the FMTs and the HP-3586B I use a MFJ-902H tuner. There is a very basic DPDT knife switch that switches the balanced antenna feed line between the two tuners. The results of all of this speak for themselves: Sometimes I'm close.